As a powerful Colorado low approaches Ottawa this afternoon, threatening to dump dozens of centimetres of snow, precautions are being taken. The approaching blizzard has caused some events and services to be called off across region. Environment Canada and police are asking residents to reconsider all non-essential travel plans due to the 30-40 centimetres of blowing snow expected to fall. School kids will be staying home Wednesday as all Ottawa school boards have now announced they will close their doors due to the storm. This includes both English and French school boards. The Ottawa Catholic School Board has also cancelled all community uses of its facilities after 6 p.m. Tuesday, including all evening classes. The board of trustees meeting is proceeding as scheduled at 7:30 p.m.
An overnight parking ban is in effect Wednesday from 1 a.m. until 7 a.m., meaning any vehicle without a residential parking permit that's parked on a street will be towed away. At City Hall, Wednesday's city council meeting has been cancelled, and everything on the agenda will be considered at the next meeting on Feb. 27. All Ottawa libraries will be open at noon on Wednesday. As well, all city recreation and culture facilities will open at noon Wednesday to allow for proper snow clearing. Starting at 4 p.m. Tuesday at the University of Ottawa (all other operations will continue). Starting at 5:30 p.m. Tuesday at Carleton University (along with all events, library service and athletics centre service, but other modified services will continue). Starting at 5 p.m. Tuesday at Algonquin College's branches in Ottawa, Perth and Pembroke. Starting at 4 p.m. Tuesday at La Cité collégiale. Flights were already being cancelled at the Ottawa airport Tuesday afternoon, and residents are advised to check departure and arrival times before leaving. ​The Western Quebec School Board has announced that schools, centres and offices in Outaouais will be closed Wednesday. The Collège Saint-Alexandre de la Gatineau has canceled all evening activities and Wednesday classes. All three campuses of the Cégep de l'Outaouais will be closed on Wednesday. 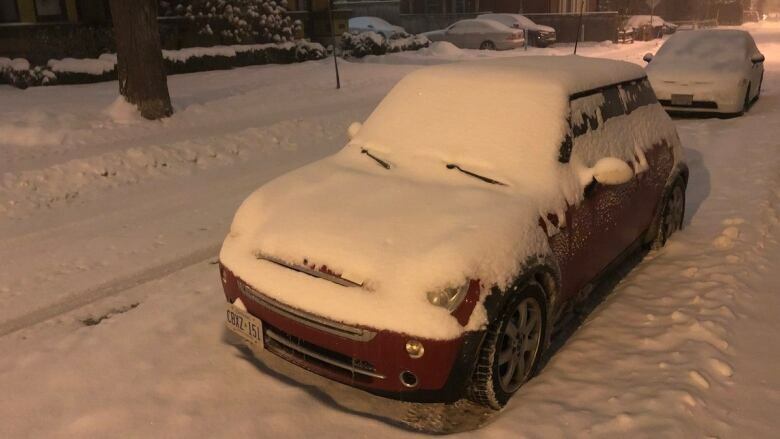 An overnight parking ban is in effect from midnight until 6 a.m. Wednesday, meaning anyone without a specific overnight winter parking permit can't park on the street. Oversize waste collection scheduled for Feb. 13, 14 and 15 has been delayed two weeks each day. Anyone with oversize waste can still bring it to the depot at 860 blvd. de la Carrière while it's open. The City of Kingston's recreation and leisure programs scheduled for 1 p.m. or later Tuesday are cancelled. The city's meeting with residents about a third bridge over the Cataraqui River between Gore Road and John Counter Boulevard has also been cancelled and will be rescheduled. Queen's University has cancelled all classes and activities on campus starting at 12:30 p.m. Tuesday. Prince Edward County, meanwhile, has cancelled Tuesday night's council meeting and public meeting on road construction in Picton. It has officially declared the coming storm a "significant weather event," and letting residents know it may not be able to meet road and sidewalk maintenance standards. The Upper Canada District School Board and the Catholic District School Board of Eastern Ontario have both canceled classes and closed their offices on Wednesday. Tuesday night's Brockville council meeting is cancelled and no vehicles are allowed to park on the street from 11 p.m. until 7 a.m. Wednesday. Renfrew County has cancelled its committee meetings on Wednesday because of the likelihood not enough members would be able to make it.